Black & Decker has produced a line of decent corded-electric push mowers (i.e. models LM175, MM275, MM575). My parents and I own a total of 3 of these mowers and really enjoy them. Although they have provided years of good service, like all products they have their weaknesses. 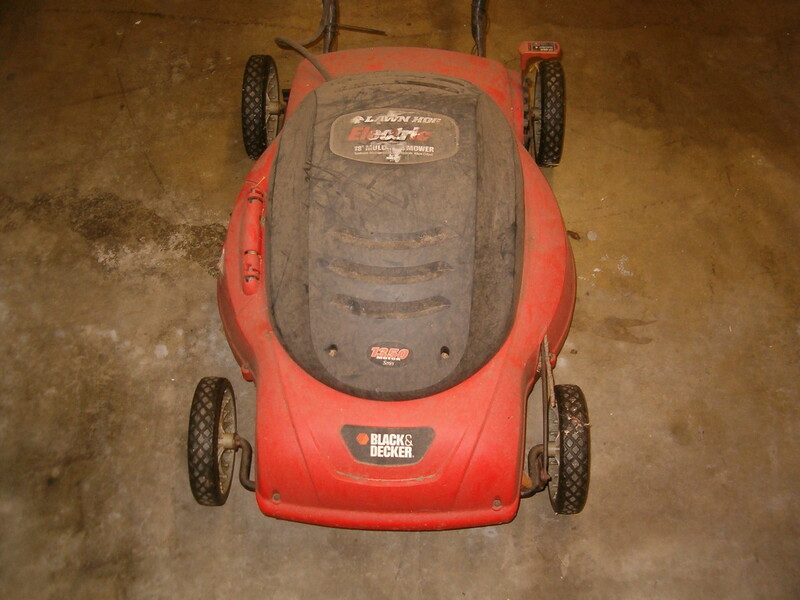 This page discusses repairing of these electric mowers. 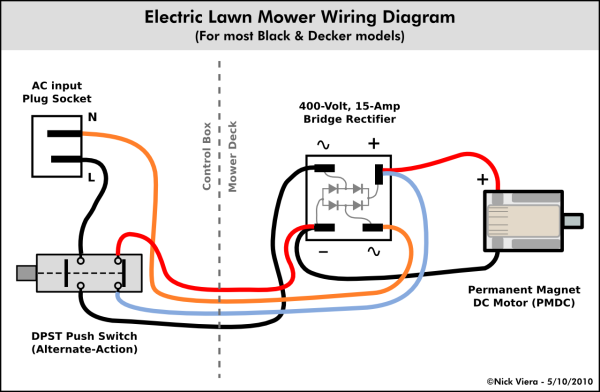 In general, corded electric lawn mowers are very simple devices. Not counting the wheels, the Black & Decker models only contain 2 moving parts: the electric motor and the electric switch assembly. The electrical system consists of only 3 parts: the motor, the switch assembly, and a standard bridge rectifier. 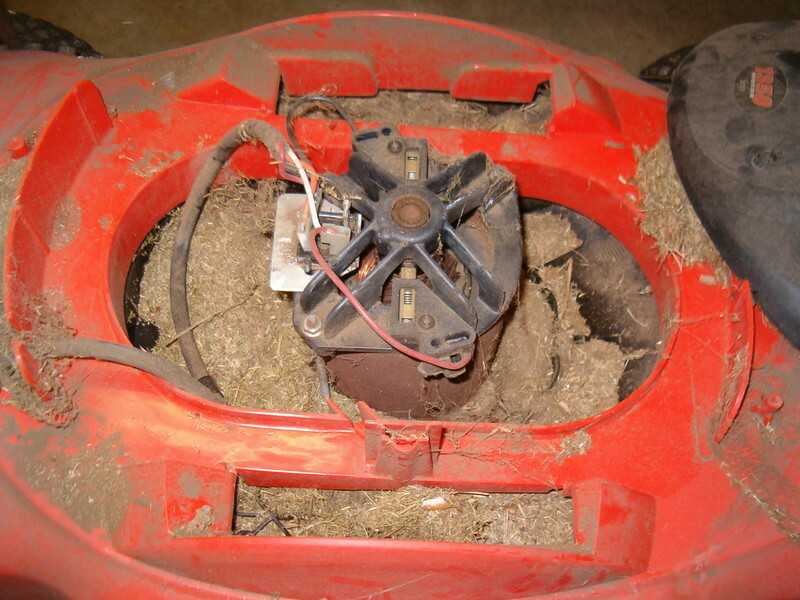 The motor used in these mowers is the exact kind of motor you'd expect to find in a tredmill. In fact, these motors probably are originally made/designed for tredmills. The motor is a brushed, permanent-magnet DC motor, which is designed to run at about 120 Volts DC. 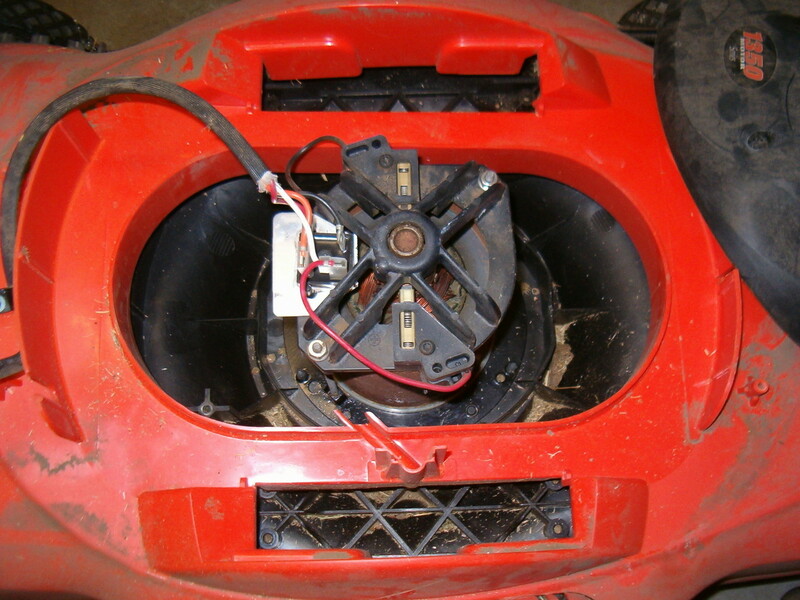 The mower's power input is 120 Volts AC "standard household power". The AC-DC conversion is accomplished through the use of a bridge rectifier, which is simply 4 diodes crammed into a box. 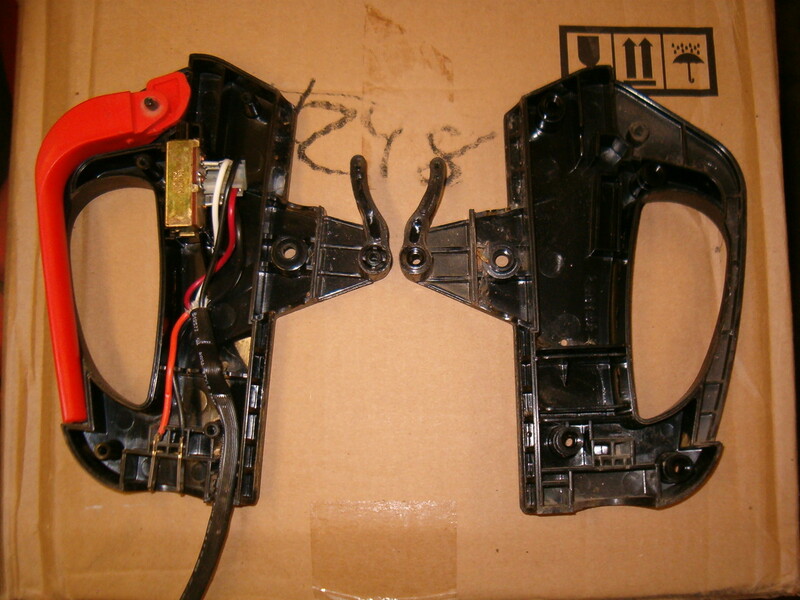 The rectifier used in most of these mowers is in an MB or GBPC package, having 4 "faston" connectors for the wiring and a single screw hole in the center for mounting to a heatsink. The peak output from the rectifier is about 170 Volts DC from a 120 Volt AC input. 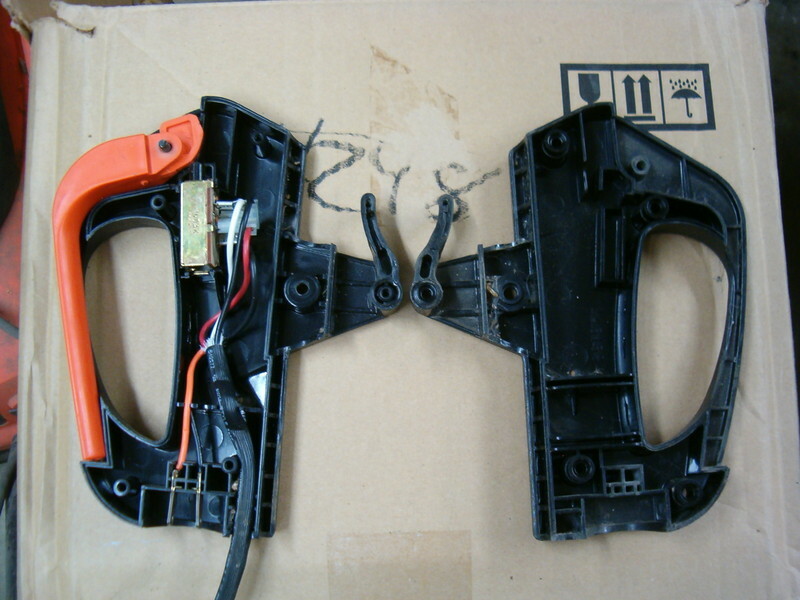 The switch assembly consists of the power input socket and a push-button switch. The switch is Double Pole, Single Throw (DPST), and is an alternate-action switch. This means that the switch controls two separate circuits and when circuit #1 is "on", circuit #2 is "off", and vice-versa. Additionally, the switch has an area about mid-travel where both circuits are "off" to prevent a short-circuit through the bridge rectifier. Circuit #1 controlled by the switch is the connection of the AC "hot" wire to the bridge rectifier. Circuit #2 controlled by the switch is the connection of the motor's + and - terminals. That's right, when Circuit #2 is "on", it is purposely creating a short-circuit across the motor terminals. 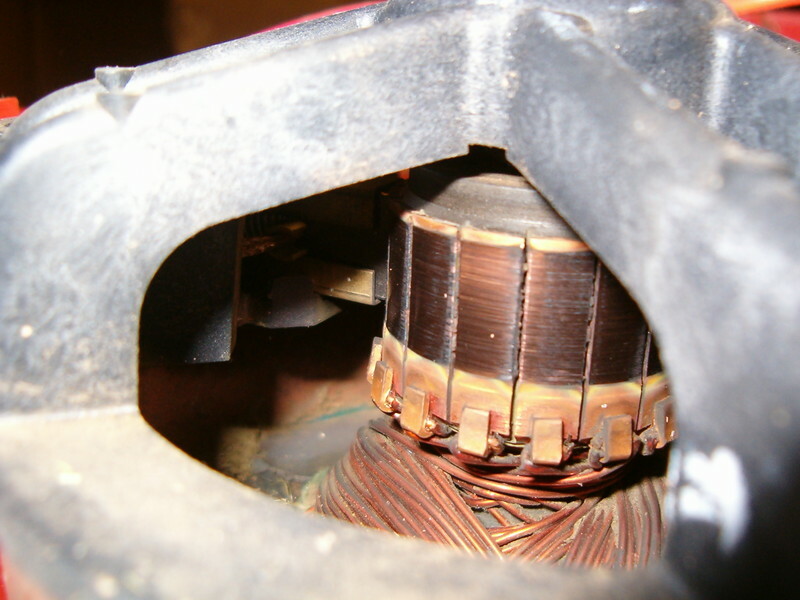 This provides what is known as "plug-braking" which is electrical slowing of the motor. 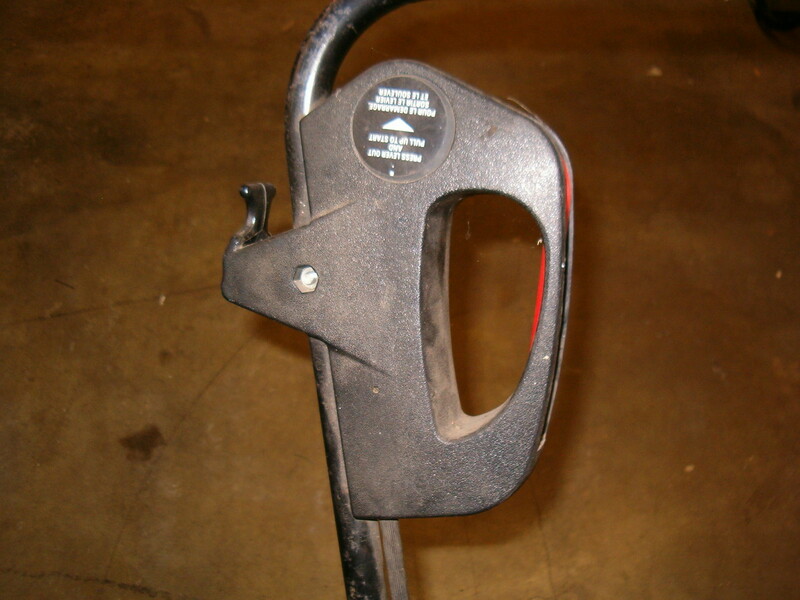 This is done because it is desirable for safety reasons to have the motor stop spinning as soon as possible after the handle switch is released. 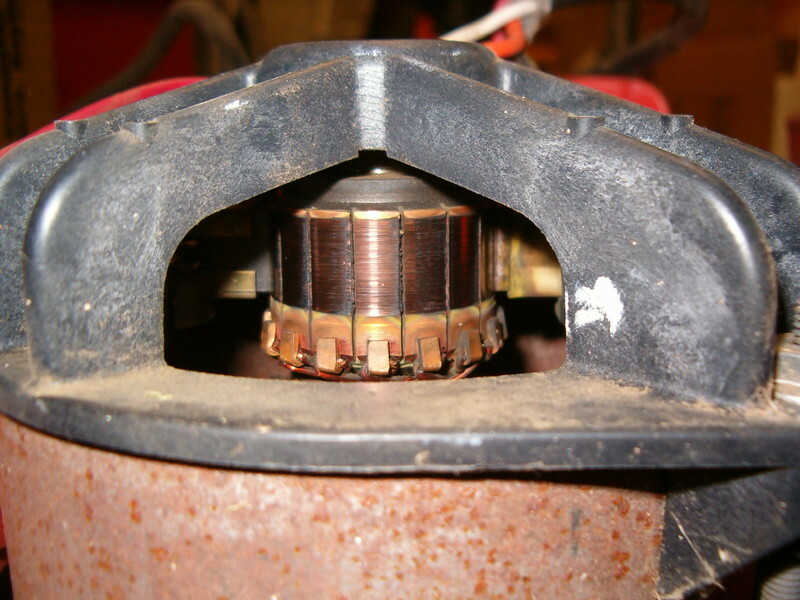 Though, the method of dead-shorting the motor to implement plug-braking is questionalbe, it works. 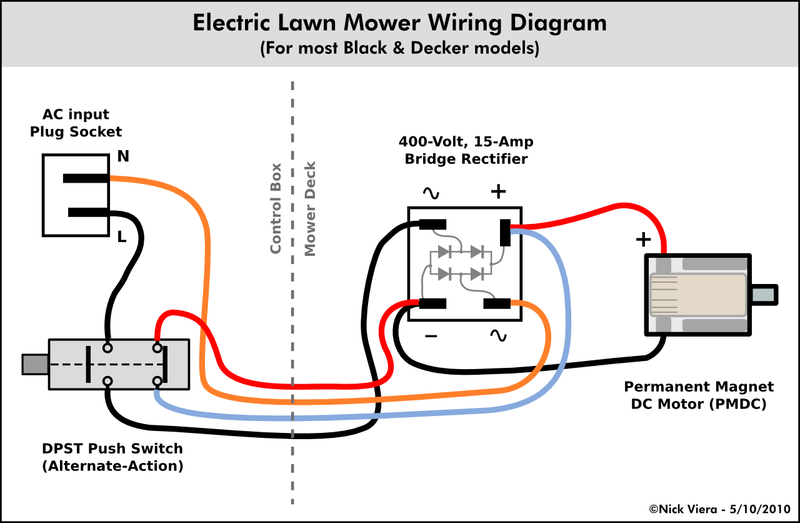 The above wiring diagram applies to most Black & Decker corded mowers. 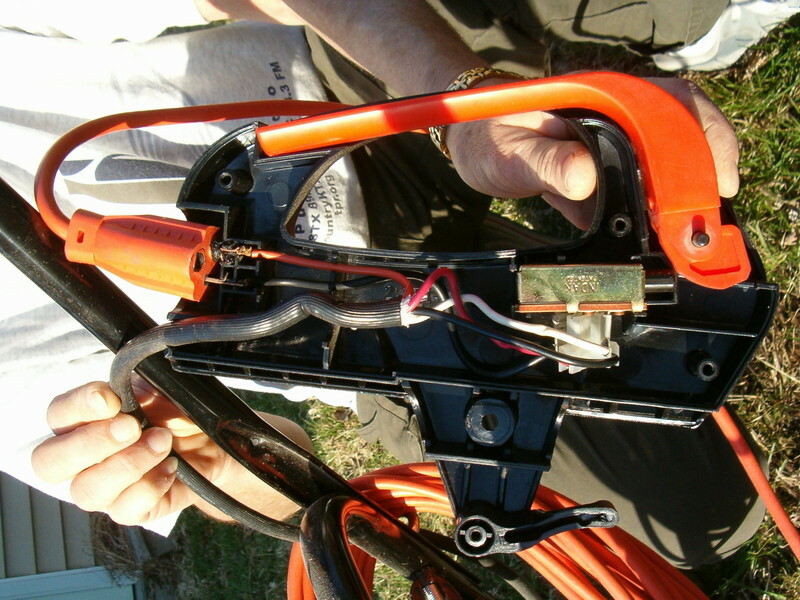 The 4 lines running through the dashed line represent the wiring harness that runs from the switch assembly down to the mower deck. Note that the light-blue wire is actually white on the mowers. 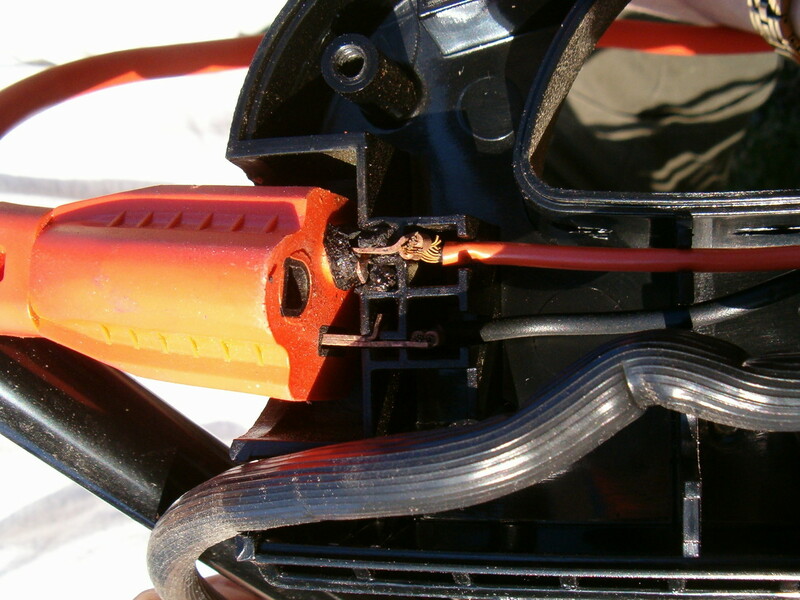 Based on my family's experiences with our 3 electric mowers, it appears that these models are prone to 2 types of failures: switch assembly failure or bridge rectifier failure. The switch assembly can be problematic in 2 ways. First, the switch itself can go bad from melting/failing of the contacts. This is a function of age and is somewhat expected given the high current flowing through what appears to be a mediocre switch. The second is loosening/melting of the input cord socket and/or wiring between the socket and switch. This can happen due to bad connections (i.e. 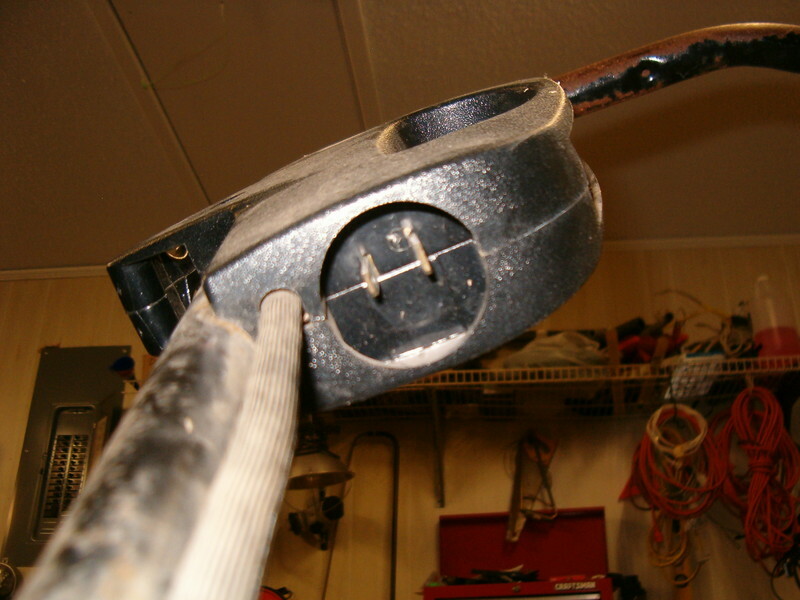 cheap extension cords), corrosion on the plug prongs, etc. Again, the high current flows present in the mower only exacerbate these issues. due to chronically loose, arcing plug prongs. The bridge rectifier can fail due to power surges, excessive arcing or flash-over of the motor's commutator, and/or heat. Heat is the most likely thing to destroy the rectifier since it doesn't have a very large heat-sink and is located right next to the motor (which can get quite hot during operation). 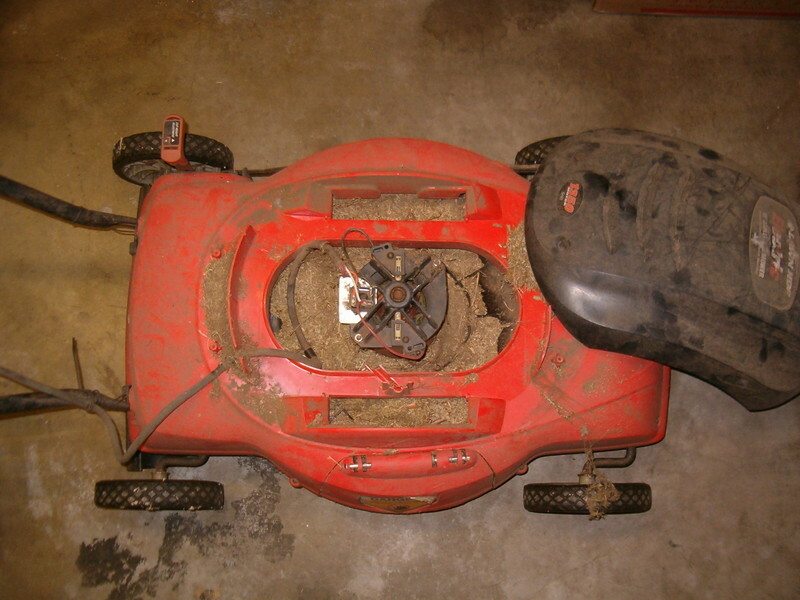 Heating of the motor and bridge recitifer is accelerated if the mower is frequently bogged down and struggling due to trying to cut excessively thick and/or wet grass. 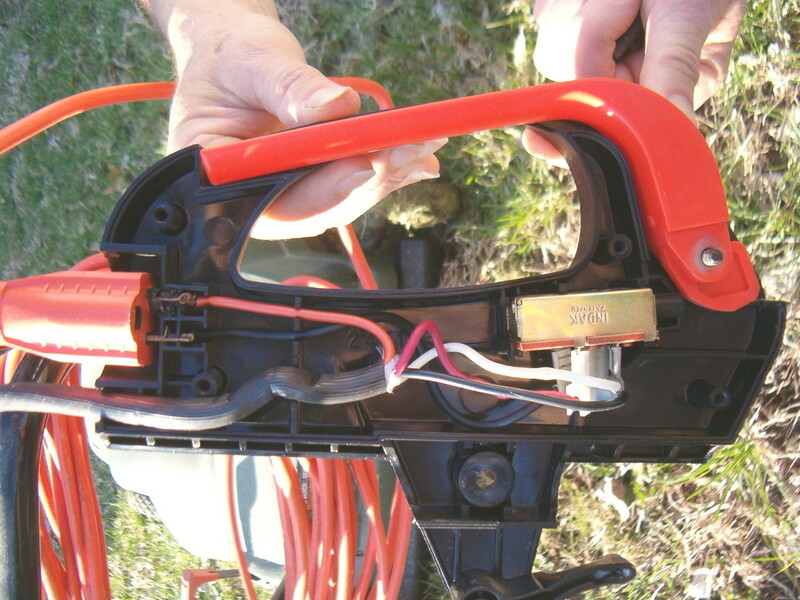 The mower's bridge rectifier is very easy to replace. 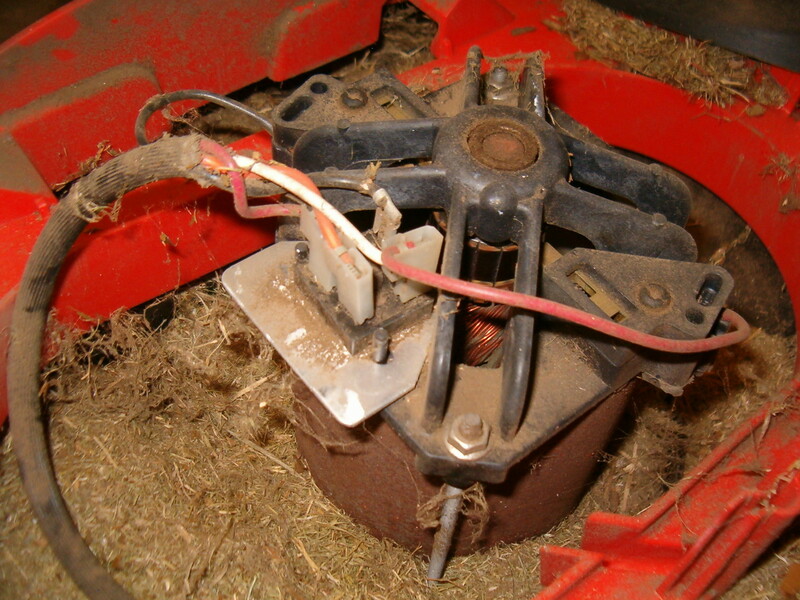 The recifier is mounted in the upper-center of the mower, just adjacent to the motor (see photos below). The rectifier has 4 connections, of which only 2 are usually labeled (+ and ~). Per the wiring diagram shown above, there are 2 AC connections, marked by ~, and 2 DC connections, marked + and - respectively. 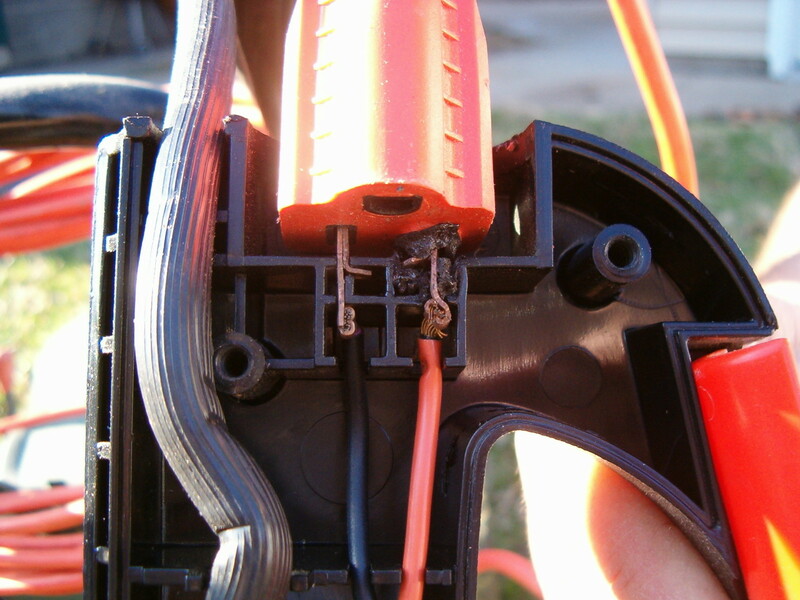 Bridge rectifier in a Black & Decker MM275 electric mower. It appears that the original bridge rectifiers (Black & Decker P/N 72256-03) are rated 400 Volts, 15 Amps. These factory parts sell for over $10, which is kind of ridiculous since these are such common parts that are available from almost any electronics supplier. 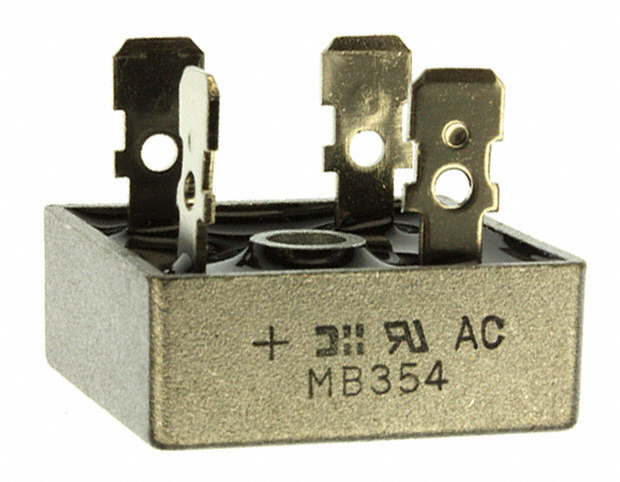 Suitable replacements include almost any bridge rectifier with the same or higher ratings. 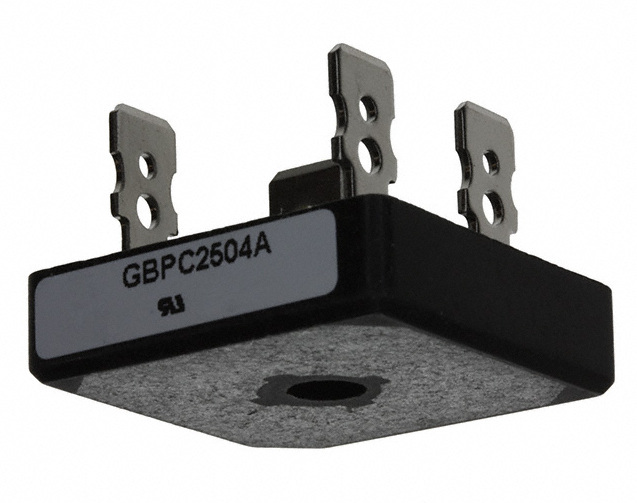 For example, Diodes Inc. P/N GBPC2504 and MB254 are 400 Volt, 25 Amp rectifiers which are suitable replacements for under $4. These are available from Digikey and many other vendors. In general, installing a rectifier with a higher-current rating and/or expanding the size of the mounting plate should increase the life of the part due to reduced heating. 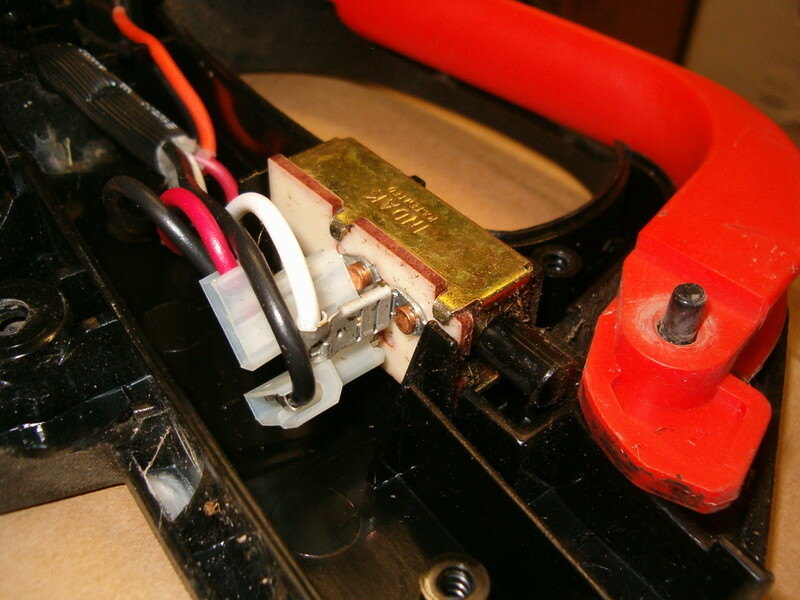 See the "Electric Mower Switch Repair" page for one possible solution.